Item Definition of field Cols Format Min. to max Default Just. units 1 record identification 1-1 A1 “S” or “R” None n/a 2 line name 2-17 F16.5 to Right 3 point number 18-33 + 34-35 Blank 4 point index 36-38 I3 1 to 999 5 point code 39-41 A3 A## Left 6 point depth 42-49 F8.2 0 to Header defined 7 tide height 50-54 F5.2 -9.99 to 99.99 8 water depth 55-62 9 map grid easting 63-72 F10.2 10 map grid northing 73-83 F11.2 11 surface elevation 84-91 to 12 day of year (Julian day) 92-94 13 time “hhmmss” 95-100 3I2 to 14 GPS time* (SEGD Timestamp) F21.6 to Seconds * The GPS Time / SEGD Timestamp is the time in seconds with microsecond precision since 06 January :00:00 (GPS epoch). Dates and times before 06 January 1980 will have a negative GPS Time value. SPS v3.0 should be fully compatible with SEGD v3.0. 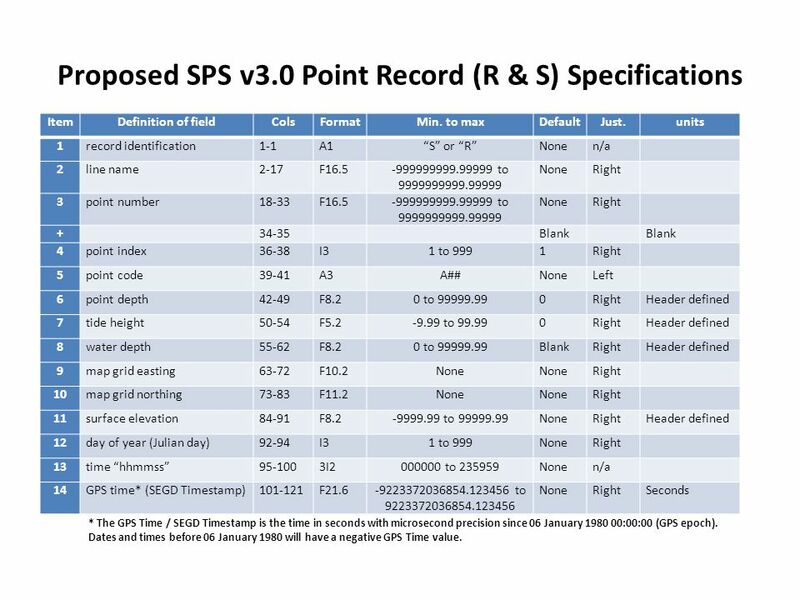 Proposed SPS v3.0 records all require less than 150 columns (as recommended by OGP) and still have room for expansion before that limit is reached. SEGD supports Short Mother Records (SMR), in which multiple source events are recorded in a single record, resulting in a many-to-one relation of source point records to an ffid on tape. This will require further generalization of the relational (X) records to allow generation of daughter records with unique ffids from the mother record. This may be a new record or file type (similar to X) or It may be a modification of the existing Relational (X) file with added records defining the daughter data Additional input relating to handling SMRs and subsequent separated daughter records is solicited from industry participants. The current recommendations are Aramco-centric mainly because we have received little feedback from seismic industry service providers when solicited. GPS time with microsecond fidelity is added to allow accurate source separation in high-productivity acquisition (such as ISS). Comma delimiting of record entries is being considered to improve robustness of the formats. [Comma-Space] delimiting is also being considered to help keep the records relatively easy to scan by eye. 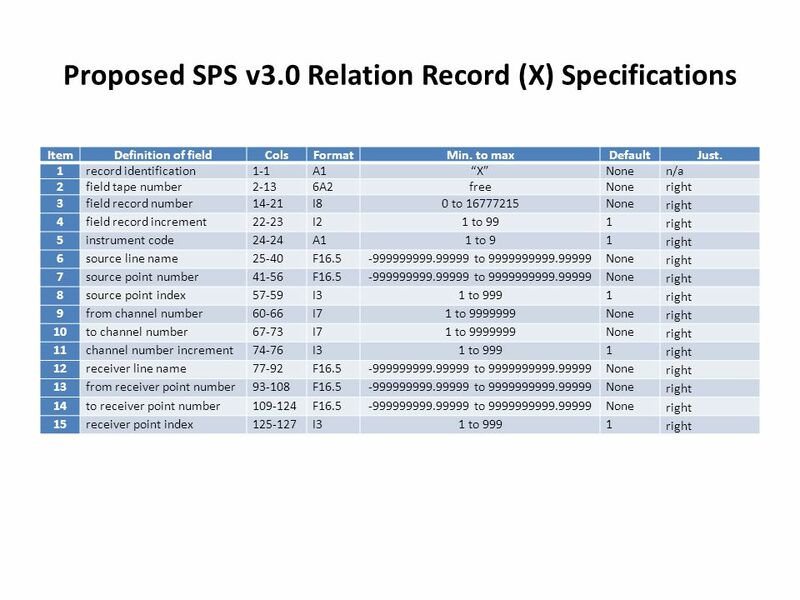 OBC data acquisition easily fits within the proposed SPS 3.0 definitions. Current and Future High-Channel Count crews require the SEGY format to increase the current channel limitation (32,767) to be compatible with SEGD (16,777,215). 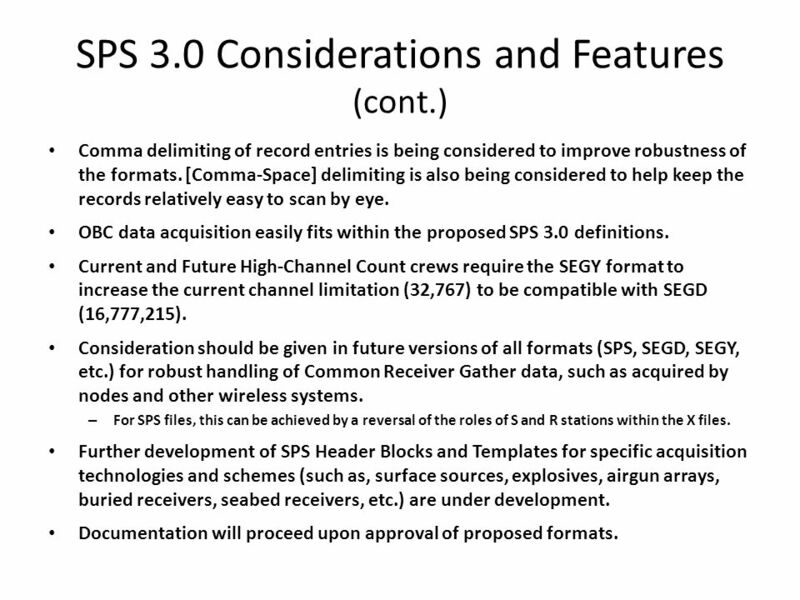 Consideration should be given in future versions of all formats (SPS, SEGD, SEGY, etc.) for robust handling of Common Receiver Gather data, such as acquired by nodes and other wireless systems. 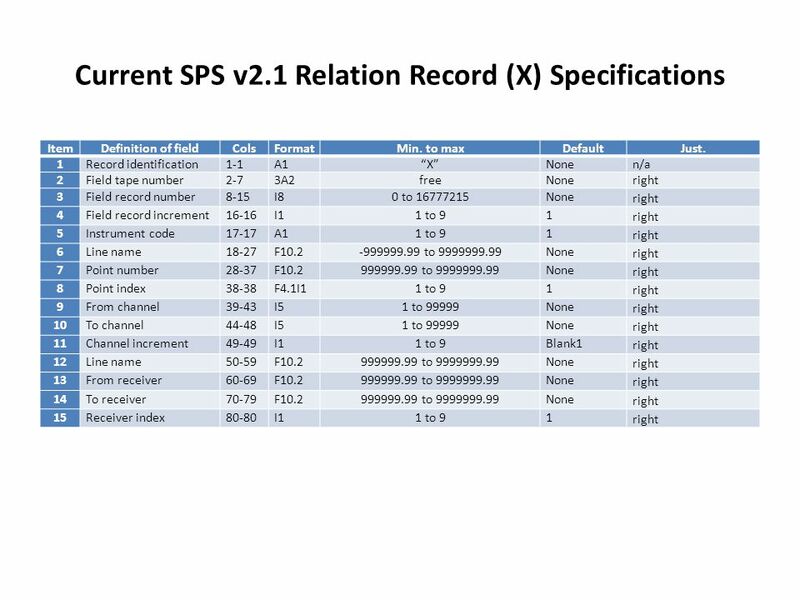 For SPS files, this can be achieved by a reversal of the roles of S and R stations within the X files. Further development of SPS Header Blocks and Templates for specific acquisition technologies and schemes (such as, surface sources, explosives, airgun arrays, buried receivers, seabed receivers, etc.) are under development. Documentation will proceed upon approval of proposed formats. 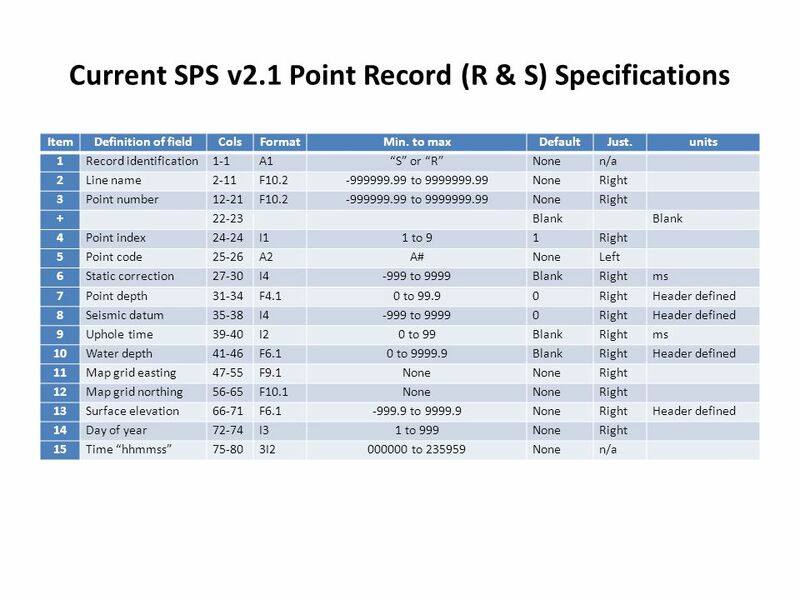 Download ppt "SPS 3.0 Update of the Progress of the SPS Subgroup of the SEG Technical Standards Committee Cignoli, J.E. ; Green, P.C. ; Hubbell, S.E. ; Moffitt, R.G. ; Siddiquee,"
SEG Technical Standards Committee Meeting SEG Annual Meeting – Las Vegas Tuesday Nov 6, 2012. SEG Y Rev 2.0 An update to the SEG seismic data interchange standard SEG Technical Standards Committee. SEG Technical Standards Committee Meeting SEG Annual Meeting – Houston Tuesday Sept 24, 2013. Importing Data into IX1D v 3 – A Tutorial © 2006 Interpex Limited All rights reserved Version 1.0. DataTools Models Data, models and tools: Dealing with any complex hydraulic engineering problem invariable use is made of: data, models and tools. Watermarking 3D Objects for Verification Boon-Lock Yeo Minerva M. Yeung. 75th SEG Houston Technical Standards Committee meeting. Atlas III Improvements Expands on Atlas II capabilities – Faceted Navigation – counts are displayed next to selectable attribute – Lunar Map interface. SEG Technical Standards Committee Energistics Western Europe Region & SIG Meeting 17 jun 2008 SEG Technical Standards Committee Energistics Western Europe. Microseismic Data Exchange Standards Stewart A. Levin Stanford University. Separating Columns in Excel. An extremely useful function in Excel is the Text to Column feature which can be used for any type of column separation but. Plan for Architectural Analysis for Identifying Query & Retrieval Components. Database Applications – Microsoft Access Lesson 2 Modifying a Table and Creating a Form 45 slides in presentation Accessibility check 9/14. Meeting of the Group of Experts on Population and Housing Censuses Geneva, 23 – 26 September 2014 Principles and Recommendations for Population and Housing.